Stephanie is a woman of enchantment. When I visited her cozy studio of Eden and Elie, it was a wonderland. As I entered the corridor, tiny sparkling beads organised in transparent boxes by color welcomed me. The fragrance of brewed coffee, and the sound of rain amplified this magical atmosphere. And there she was, calmingly beading a new piece of pendant for her next collection surrounded by myriads prototypes of necklaces and earrings. She reminded me of an alchemist, one who transforms raw materials into a precious creature through a magical process. She was trained as an architect and worked as a product designer for a long time. For the past three years, she is now an entrepreneur and the founder of Eden + Elie, a jewelry brand based in Singapore. Her signature collections are intricately handcrafted beaded necklaces and bracelets. Through this interview, I came to understand why it was the love at the first sight when I encountered her Jewelry. What captivated me most was her mission as a designer, to create a simpler life for modern women. Stephanie, How would you introduce yourself? I’m a maker and a designer, with a bit of an engineer, teacher and artist all rolled into one. Your brand stands for ‘the love of a simpler life’. How do you define ‘simplicity’? Simplicity is found when you have the essential and nothing superfluous. As a consumer of your brand, I think ‚Everyday collection‘ perfectly reflects your definition of simplicity and embodies timeless aesthetics. What inspired you to create this concept? I wanted to design a necklace that could be worn everyday. Just like a piece of well-loved clothing. When we think of an everyday piece of jewelry, we think of something is part of our body. Like a gold chain or perhaps a wedding ring. What I wanted to though, was to design a necklace that could be worn everyday, something that could adjust to the wearer’s need for that day. Most women, I believe, would choose to wear a necklace compatible with the neck line of their blouse or dress. They would pay attention to how the necklace drapes, at which point does it hit a collar, or go past a bodice, or a ruffle, or buttons. Does it sit on the collar bones, or does it rest deeply inside a shirt? I realised that such a necklace would have to be adjustable in length, and hence I created my necklaces to be worn short or long, and detailed the ends of the necklace such that there are no unfinished ends. Wearing it short, for instance, would leave you with a beautiful drape of gold chain in the back if you wanted to leave it exposed if you wear a low back dress. Hence to me, something being “everyday” doesn’t mean thoughtless or ordinary. It means versatility and ease, both of which are concepts very attractive to me. Are there any designers or artists who have influenced your design sensibility? I was trained as an architect and spent many years in architecture school immersed in studying great buildings. In designing buildings, every piece of material counts and costs – whether in substance, in labour or in just occupying space. I love the work of the Masters like Louis Kahn, Alvar Aalto – their work embodies not just timelessness but grace. They know how to work with light and shadow, with solid and void – the language of what gives form and makes space. 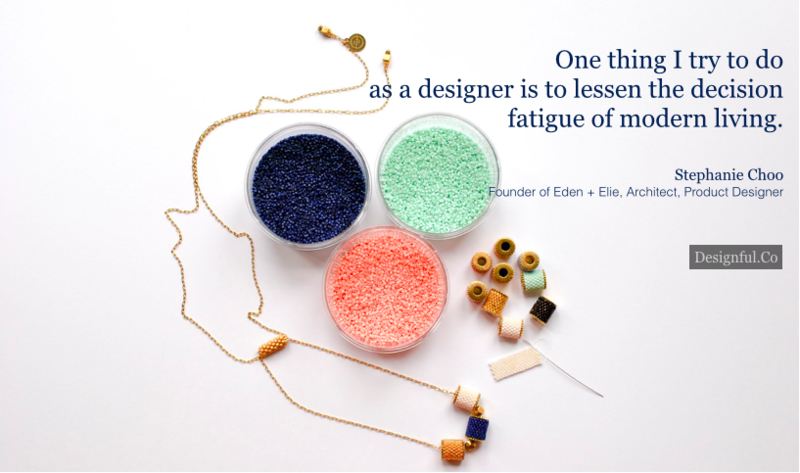 How has your practice as a architect and a product designer influenced your way of designing jewellery and running your business? My training in architecture provided the basis for me to approach design with a perspective that form, matter, tactility, texture, light and shadow are all ingredients of making something sublime. For me, I may create from intuition but I always go back to view it with a critical eye – is it too much? or the opposing question – is it enough? For something to be just right – there is a feeling of that timelessness and grace – that it is poised to just “be” – it is not in tension one way or another, overwrought or decorative for the sake of itself. I’m not sure it is a case of being an architect or product designer that has influenced the founding of Eden + Elie. But I certainly approached it from a product and design-centric perspective. The practice of making direct prototypes from quick sketches and not to getting too precious about the idea while it is on paper form is what I think my training helped me to do. I usually go straight to working with the materials; sometimes with a rough sketch to start with, but most of the time, without. Because the materials themselves have finite dimensions, form and texture, I find it more direct to design with them straight away. This leads to many many trials and prototypes. But you always learn something from each – either what you’ve visualised is not possible, or better done a different way or you discover something even better. I love your interpretation on Asian design expressed through the Modern Peranakan Collection. What’s your views on ‘Asian-ness’ in art and design? I have lived in the US for a long time. And I never considered myself an Asian designer. I think while cultural references are strong and present – some references are so recognised they are deemed “iconic” – I don’t think there is one way to identify Asian-ness and I am careful not to reduce a very complex and rich identity borne by many different people groups to one type of “look”. For me, design is about curiosity in people, in stories, in culture, in the making of things. My mum brought me to a maker of Peranakan beaded slippers when I was growing up and I remember vividly how we selected the colours, beads and patterns of what would be our custom-made slippers. Even then, I remember the ladies discussing what colours and patterns were more “Peranakan” than others – what were they referring to if not for a deeply embedded visual memory to what Peranakan design looks like? Our customers also comment when selecting our bangles – this colour is “very Peranakan” they would say. Hence, I feel that we have captured something of that form – something that brings people to a memory, or a reference. The Modern Peranakan Collection is inspired by the colours and motifs found in Nonya kebayas. My intention is not to take it wholesale and make a replica of it on piece of jewelry, but to make it into something new, while still carrying a bit of the old. Musicians understand this when they modulate a piece of music – there might be recurring phrase or motif but the piece has become something different. The best architects do this in designing buildings – incorporating a bit of the old with a new palette of materials maybe. Nobody sets out to replicate an old building – restore yes but to make replicas to me, is a pointless exercise. Hence we ask, what do modern women want to wear? Would they wear our necklaces and bangles, even if they are not dressed in a sarong kebaya? Would it look out of place? Can you appreciate it even if you are not Peranakan? I think if we can answer yes, then we have succeeded in making good design. In the age of overabundance of everything, I think modern women desire to simplify their lives while pursuing timeless beauty. What are key insights you have learned about your consumers: the modern women? I think women who have come of age face expectations and demands in every generation. For ours, I feel we have tremendous pressure to be excellent in everything we do, whether it is in raising our children, leaning in to our work, or just doing it all and doing it effortlessly. We are faced with choices and decisions everyday that we try to meet with courage, clarity and dignity, in the areas of work and family. Most women desire more rest, more simplicity, more ease. I feel that one thing I try to do as a designer is to lessen the decision fatigue of modern living. So that we have energy, time and focus to apply to what is most important and essential to us, whatever that may be. If my jewelry is that well-loved go-to piece that helps someone get ready in the morning, is purposefully designed, meaningfully made and brings delight to the wearer – I think I would have succeeded in making life a little bit simpler for the modern woman. Stephanie uses design to transform organisations. She has worked in the fields of retail, F&B, hospitality, education, and government to design services, processes, products and space. Stephanie has taught Design Studios at the UC Berkeley and the National University of Singapore. She received a Bachelor of Science degree from MIT and a Master of Architecture from UC Berkeley. Banks, be the wrap dress.